After much anticipation, Apple unveiled its newest additions to the iMac lineup during its 2017 Worldwide Developers Conference (WWDC), giving us a closer look at the company’s high-end iMac Pro and the newly-revamped iMac. How does the new iMac differ from the previous generation when it comes to hardware, software, and other extraneous features. Let’s take a look at the latest hardware upgrades. The iMac lineup had been languishing for almost two years, and its discrete GPU options were definitely starting to show their age. Given Apple opted to include mobile-grade graphics chips in the last iteration of the iMac, they didn’t exactly stand the test of time. Thankfully, this has changed with the latest generation of the all-in-one machine. At the WWDC 2017 reveal, Apple chose to focus on GPU hardware updates, and a modest albeit welcome CPU upgrade. The 21.5-inch iMac now comes standard with Intel Iris Plus Graphics 640 GPU with 64MB graphics cache. 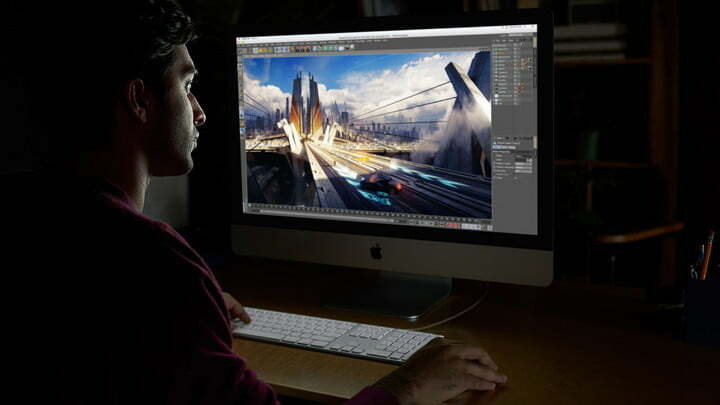 The 4K 21.5-inch iMac boasts the new AMD Radeon Pro 555 and 560 options with up to 4GB VRAM. 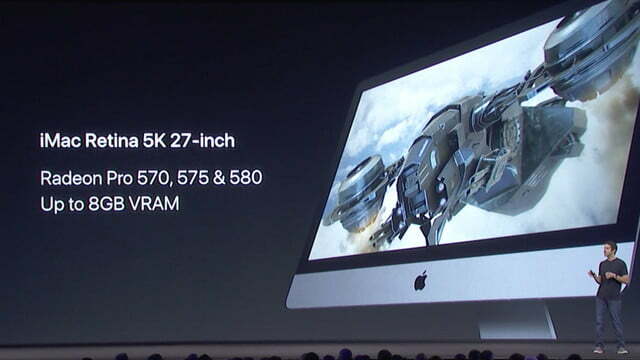 The high-end 5K 27-inch iMac has added AMD Radeon Pro 570, 575, and 580 options with up to 8GB VRAM. The 21.5-inch model has up to Up to 32GB RAM, and the 27-inch model will have up to 64GB. The Radeon RX 580 is AMD’s best graphics card for the mainstream market. The card is in essence a tweaked version of AMD’s 2016 Polaris chip. With a base speed of 1,257MHz and a boost speed of 1,340MHz, this card is an economical way of supporting high-end VR headsets on the iMac. However, after the SIGGRAPH convention in July, the RX580 will no longer be the fastest AMD graphics card available, as AMD is set to unveil its new Radeon RX Vega cards. In addition to nimble new GPUs, Apple has now finally implemented Intel’s 7th-gen Core processors across the board. The iMac update features up to a 4.2 GHz clock speed, up to 4.5 GHz with Turbo Boost. It will also latest support twice the memory of its predecessor. 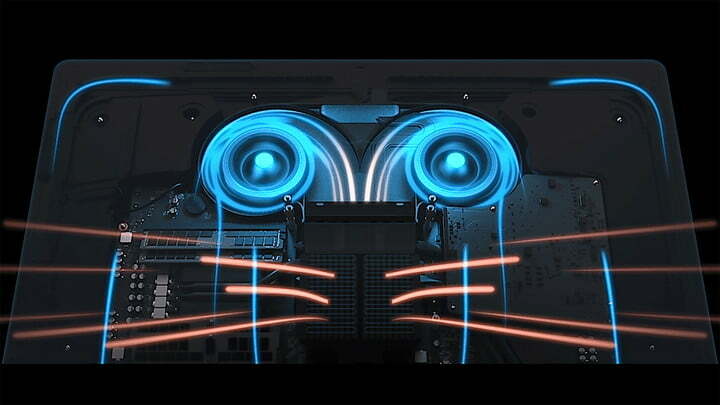 Apple’s Fusion Drive will also now come standard on all 27-inch configurations, as well as the 21.5-inch iMac. 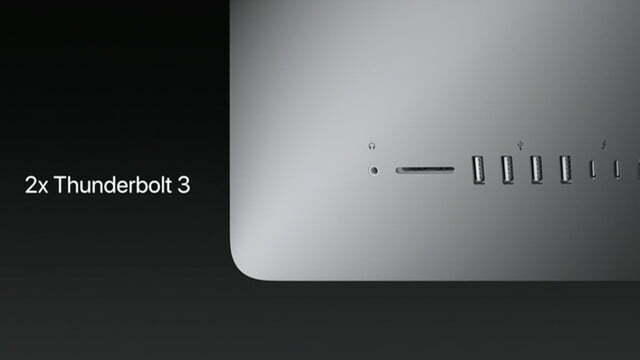 Finally, the new iMac will come with two Thunderbolt 3 ports, meaning the latest iteration will support both an external display and drive enclosure. One of the highlights from the WWDC unveiling, was the news that the latest iMac line will support virtual reality systems. This was handled in true Apple keynote fashion, complete with a casual real-time movie scene composition in the Star Wars universe featuring a Darth Vader vignette. Senior Vice President of Software Engineering, Craig Federighi, announced a Thunderbolt 3-based external graphics card enclosure supported by the latest macOS update High Sierra. With the latest moves and upgrades, the full line of all-in-ones will finally support virtual reality through the HTC Vive. Oculus Rift support is not available yet. Apple also announced an update to Metal, Apple’s advanced graphics technology. This optimized version, Metal 2, will work alongside latest macOS upgrade and utilize machine learning, as well as Apple’s language comprehension and facial recognition tools to improve overall performance, and aid developers in pushing existing hardware to its limits. Apple stated that High Sierra will receive software packages geared toward encouraging VR development on MacOS. A preview of High Sierra was released to developers at WWDC 2017, and the public beta version is planned for June. The free update will be launched later this fall. 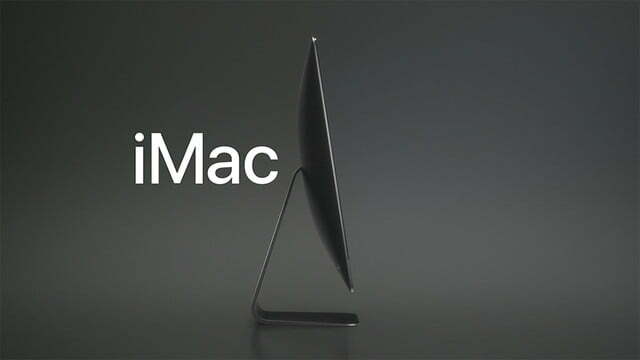 The latest iMac will feature the most vivid iMac display to date. Apple has greatly improved both the brightness of both its 4K and 5K displays. This overhaul has improved color support with 10-bit dithering, and increased color gamut support, allowing the iMac to display up to one billion colors. These upgrades make the latest display 42 percent brighter than the previous iMac. This enhanced display, alongside the GPU upgrades, will give users the most “true-to-life” viewing experience on the iMac to date. At Apple’s annual developer conference, the company also announced general additions and upgrades to latest macOS, High Sierra. Check out our full overview of the new operating system for all the details. One of the juicier moments from the iMac segment was the surprising iMac Pro announcement. This model will be available with a vibrant Retina 5K display combined with a stabdard 8-Core processor, upgrade to a 18-Core Intel Xeon processor. It will also support latest AMD Vega graphics hardware, 10-gigabit Ethernet connectivity, and up to 128GB of memory, making the unit the most powerful and capable Apple desktop to date. The company even drew up a fancy graphic just for the occasion, to depict the new thermal design and dual centrifugal fan system aimed at keeping all of this added power in check. The general exterior design isn’t too dissimilar from the previous generation, but the iMac Pro will come in Space Gray. The iMac Pro is slatted to go on sale in December. The announcement handled the iMac Pro with rather broad brush strokes, but we expect to find out more about the device in the coming months. For the entry-level 21.5-inch iMac, pricing starts at $1,099, $1,239 for the 4K 21.5-inch iMac, and $1,799 for the 5K 27.5-inch iMac. At WWDC 2017, Apple announced that the iMacs will be available starting June 5. 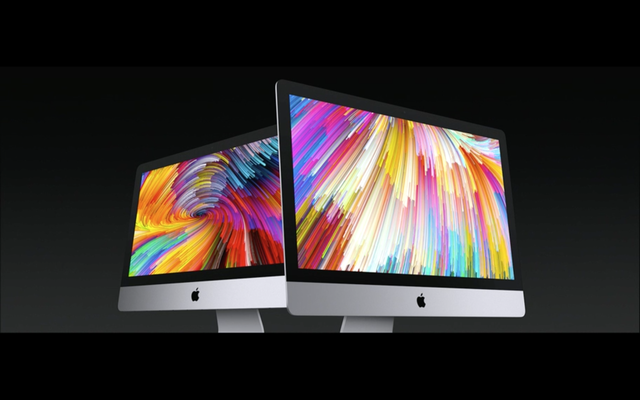 The entry-level iMac Pro will start at $4,999, and will be available starting in December. Registered Apple Developer Program members can purchase the External Graphics Developer Kit for $599. This kit includes a Thunderbolt 3 external PCI expansion chassis, AMD Radeon RX 580 graphics card with 8GB VRAM, and USB-C hub.